install ransomware which locks your files and will only release them when you pay money. May encourage you to make a payment to a criminal believing it is a real invoice or email request. It could be sent by an automated system or it could be more targeted attack. A more targeted attack will identify you and aim to encourage you to click on a link that is particularly interesting or relevant to you. If you have clicked on a link and divulged your personal bank information, contact your bank immediately, the emergency details will be on your card and change your password for a strong password. If you have downloaded malicious software follow the advice here. This is an attack which relies on peoples natural curiosity to tempt them to follow a link. The best guard against this is education. Install antivirus and anti-malware solutions and set these to regularly update and carry out regular scans. It is recommend that you do not rely on free versions of these. Disable macro scripts for email files, Office viewer software for opening Microsoft Office files might also be a consideration. Prevent or restrict the execution of programs in locations such as temporary folders used for internet, or Zip files (compression/decompression programs) including those located in the AppData/LocalAppData folder. 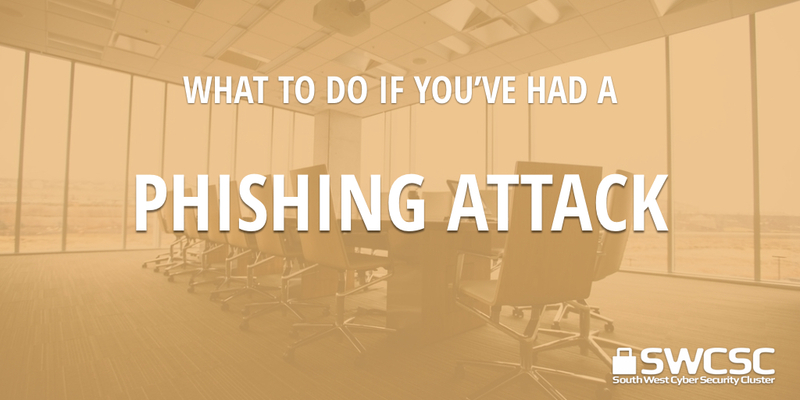 Continually train your staff to help them to be aware of phishing emails. Often these can be very convincing but there may be clues such as spelling mistakes or having an urgency about them to encourage you to click on them. Before you click on any link hover over it and see where they direct you before you click. If links are to a company’s website, visit the company’s website yourself rather than click on the link. Take your time opening emails, always look for any typos, capital letters where there should be lower case, extra spacing and full stops missing. Be aware of and fuzzy or unclear logos. Take your time rather than respond to any ‘urgent action’ type emails.